Divya Kutki Churna is an ayurvedic product of Swami Ramdev's Patanjali Ayurved and Divya Pharmacy. 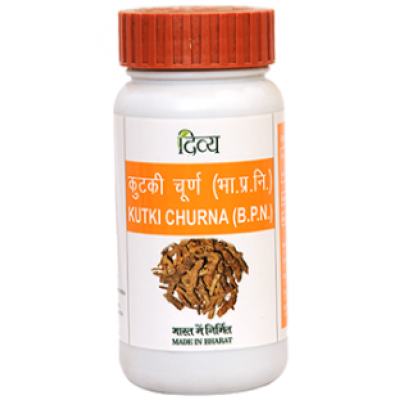 Kutki Churna protects the liver against damage from the hepatitis C virus. It also protects the heart, provides immunity and improves digestion. Kutki is a very bitter root that has wonderful anti-inflammatory and antibacterial properties. Divya Kutaki literally means pungent which is strange as it is aver bitter tasing herb. Buy Divya Kutki Churna it is a best tonic for Liver, Fever, Jaundice and Weight Management. Dose: 1/2-1 gram powder twice or thrice daily empty stomach with lukewarm water or milk or as directed by the physician.